Because hey, you can’t be too careful. A kindergarten teacher in Bainbridge Island, Washington, actively denies her male students the opportunity to play with Lego blocks in order to encourage her female students to play with them. Karen Keller bars the boys in her class from playing with the colourful blocks, even going so far as to lie to them about their opportunity to play. “I always tell the boys, ‘You’re going to have a turn’ — and I’m like, ‘Yeah, when hell freezes over’ in my head,” Keller told the Bainbridge Island Review. Lego and “social justice.” We’ve been here before, you know. Just press your face down on the scanner. For the most part, the portable computer is a dream machine for the few… On the whole, people don’t want to lug a computer with them to the beach or on a train to while away hours they would rather spend reading the sports or business section of the newspaper. Somehow, the microcomputer industry has assumed that everyone would love to have a keyboard grafted on as an extension of their fingers. It just is not so. In 1985, the New York Times claimed a weekday circulation of just over one million copies. Specifically, 1,013,211 on March 31. In 2015, when most Americans have computers in their pockets (and even use them at the beach and on trains), print sales of the New York Times have fallen to around half that figure, and the paper is chiefly read via the kind of devices once dismissed as implausible. Rather than “whiling away the hours reading the sports or business section,” the majority of readers are now “flybys,” their stays lasting for an average of four minutes, generally to read something linked via email and social media. And browsing one article isn’t quite the same thing as reading a newspaper. I’m happy to say that I’m just going to keep on microaggressing. I like to think that I’m generally polite, so I won’t express these views rudely. And I try not to inject my own irrelevant opinions into classes I teach, so there are many situations in which I won’t bring up these views simply because it’s not my job to express my views in those contexts. But the document that I quote isn’t about keeping classes on-topic or preventing personal insults — it’s about suppressing particular viewpoints. And what’s tenure for, if not to resist these attempts to stop the expression of unpopular views? If, for example, you don’t regard a person’s melanin level as both a fascinating detail of their being and an inexhaustible license to invoke victimhood and deference, then you’re probably committing a microaggression. And the publicly-funded University of California thinks you may be “sending denigrating messages” and “creating a hostile learning environment” because you aren’t awed and enthralled by how brown a person is. “We don’t want to hear about these bourgeois writers like Shakespeare,” says [Californian school teacher, Dana] Disbiber. “Worry not, teaching him helps the progressive cause,” replies [New Republic columnist, Elizabeth Stoker] Bruenig… When politics is everything and everything is politics, nothing escapes the commissar’s judgment. It is one thing to analyse art for its political content — critically necessary even – but it is quite another to subjugate one’s view of that art to one’s politics. Of course Orwell, like Shakespeare, is - to use Disbiber’s parlance - a dead white male, and worse, a critic of piously narrow attitudes like those of Dana Disbiber. We must therefore regard both authors as insufficiently progressive and entirely devoid of relevance. Utah Valley University, with an enrolment of about 34,000 students, is trying out a staircase with lanes. Lane one is for walkers, two for runners and three for texters. Feel free to share your own links and snippets below. It’s what these posts are for. A neighbour came home from work around 1 am and found a man staggering around the parking lot covered in blood. When police interviewed the man about what had happened, the man told them he and his roommate had got into a heated debate over whether the iPhone or the new Samsung smartphone is better. The roommates’ argument escalated and they ended up stabbing each other with broken beer bottles. One of the men smashed a bottle over the back of the other man’s head. Feel free to glass each other in the comments. Men and women disagree on girth and staying power. A comment left at Althouse on the subject of smartphones and what’s expected of them. Here’s an essential purchase for the coming festivities. We may live in a materialistic world, but Aussie educator Andrea Thompson has created a fun way to help the next generation understand the importance of social responsibility in a new family board game. Fair Go is a unique board game where the winner is determined by who has the best reputation for philanthropy and social justice. From what I can make out – and it’s not always easy to follow - it’s a kind of “social justice” Monopoly, in which rolling a double six doesn’t get you an extra turn and you don’t get any money when you pass ‘Go’. The game is advertised, proudly, with the following endorsement by an unspecified grandma: “Great holiday fun – nobody finishes before the others.” And yes, there’s a thrilling video of Fair Go being played, albeit in a somewhat unexcited manner, by two right-thinking persons who, I’m sure, are feeling good about themselves. 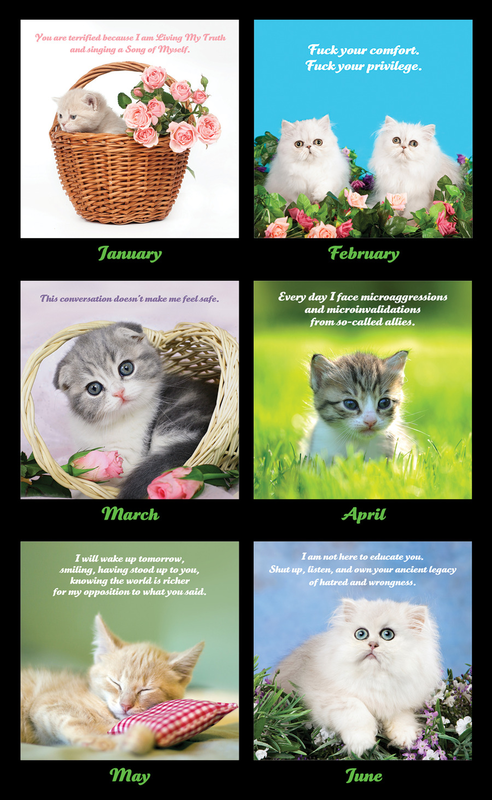 Brave warriors, behold: The Social Justice Kitten Calendar. Previews here and here. 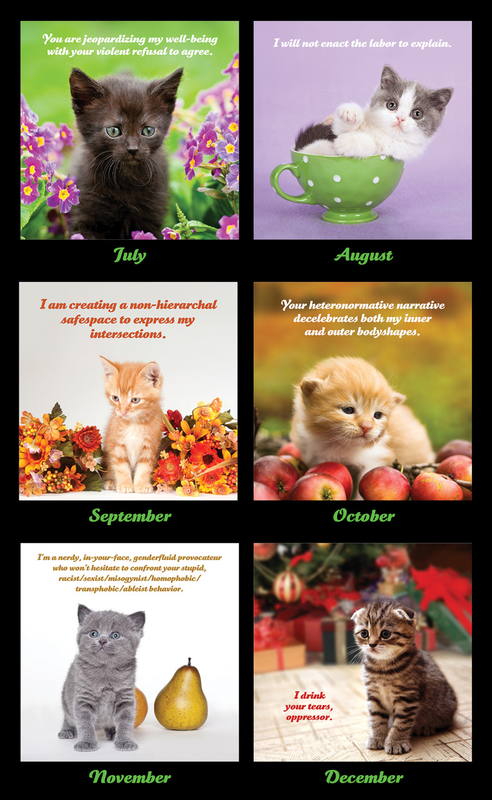 I think July is my favourite. From Japan’s Teramoto Corporation, a thrilling breakthrough in dog behaviour management. “It shapes winsomely and is not intimidating.” There’s a pdf, a gallery and a video. Via sk60. Because you’ve always wanted an electronic whistling machine.